Ever notice how on the British West Indies there are just a few or just one big gun per island or country — like DDL, Appleton, Mount Gay, Foursquare, Angostura, St Lucia Distilleries, St Vincent Distillers, Rivers Royale, and so on — while the smaller islands from the French side like Martinique, Guadeloupe, Reunion and Mauritius seem to have little outfits all over the place? I don’t know what’s behind that – maybe it has to do with the commercial cultures of each sphere. Whatever the case, one can’t fault the results of multiple distillers competing fiercely for global bucks and worldwide street cred, because it all redounds to the benefit of us rum chums, and these distillers sure haven’t let a few centuries of experience wither on the vine and be forgotten. 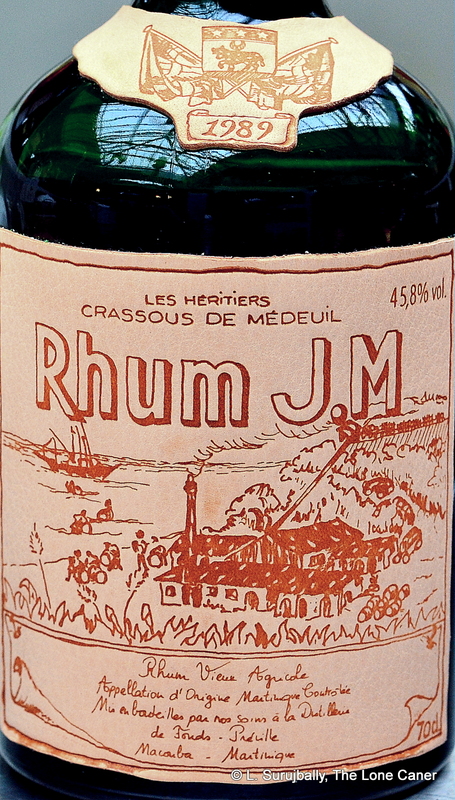 Consider, for example, J.M., which is among the last of the family operated independent distillers operating on Martinique: the initials refer to Jean-Marie Martin, a previous 19th century owner, and the estate has its origins with the famed Pere Labat way back in the 1700s, though it has changed hands several times since then. With the surge of interest in agricoles over the last five years or so their profile has been raised somewhat, with good reason – what they make is damned fine: I’ve tried just a few of their rums so far, none of which scored less than 86, and this one, issued at 47.2% is just as good as the others. Just as a side note, there are two variations of the Millesime 2000 – one was bottled in 2009 at 47.2%, which is this one, an eight year old; and another one bottled in 2016 at a lighter 41.9%, a fifteen year old. The one I have is something of a premium edition, a numbered bottle meant to celebrate the arrival of the 2000s, silver-wrapped green bottle and enclosure, pretty cool looking. Samples came courtesy of (and with thanks to) Cyril of DuRhum and Laurent of “Poussette” fame, and I’ve pilfered Cyril’s picture to give you a sense of how it looks. What was surprising about the AOC rum was how it nosed more traditionally – creme brulee and cheesecake to start with, backed up by a very light line of acetone and furniture polish (!! )…not quite the profile I was expecting. Still, these aromas developed over time to a more commingled crushed apple juice, together with honey, raisins, cream soda, nutmeg and cinnamon, and it was all quite delicate and clear — only after about fifteen minutes or so did additional fruits, herbs and the characteristic grassy and citrus smells start to poke through, adding some nuts and light oak to the whole mix. Tastewise it was just lovely. Light and perfumed – the strength was perfect for what it presented – with lots of delicate breakfast spices, grass, citrus, herbs, smoke, leather and woods. Florals were more noticeable here, frangipani and hibiscus, plus a more salty profile taking the front seat as well – brine, olives, cream pie crust, cereals, toblerone, white chocolate and almonds. It was very well balanced off between these tastes, and was not so much crisp as simply well integrated and easy. The fruits in particular were hard to distinguish…they existed the notes of green grapes, some apples and pears took some time to ferret out, and I felt the vanilla became somewhat over-dominant towards the end, obscuring other aspects which worked better. The finish gave no cause for complaint, though — short, as was to be expected, with nutmeg, vanilla, aromatic tobacco, orange zest and some more light fruits. Overall, this was one of the better agricoles I’ve had over the years. 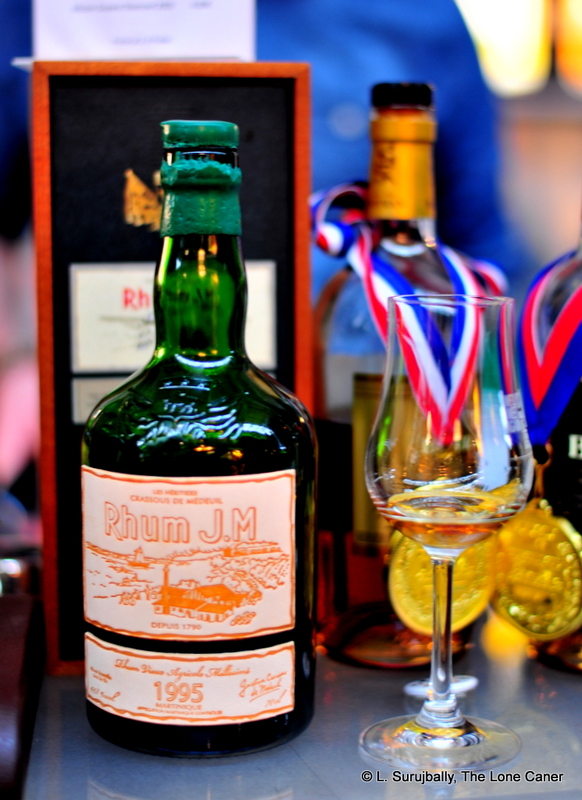 It was another one of those JM rhums which defined itself by being quietly unique in its own way, while never entirely losing touch with those aspects of the agricole world which make them such sought after products in their own right. Our senses are led gently through its composition, the high points hinted at without being driven home with a bludgeon and it has a quiet voluptuousness which is never punched up or intrusive. This is a rum we don’t tipple or swill or cautiously sip – we sample its languourous charms, enjoy the experience, and glide through to an appreciation of its construction. And when it’s over and the glass is empty, we may not entirely recall the experience with clarity…we just know we would be fools if we didn’t pour ourselves another glass. It’s that kind of rhum. After a tough day at work, the Cuvée 1845 is a balm to the exhausted mind. 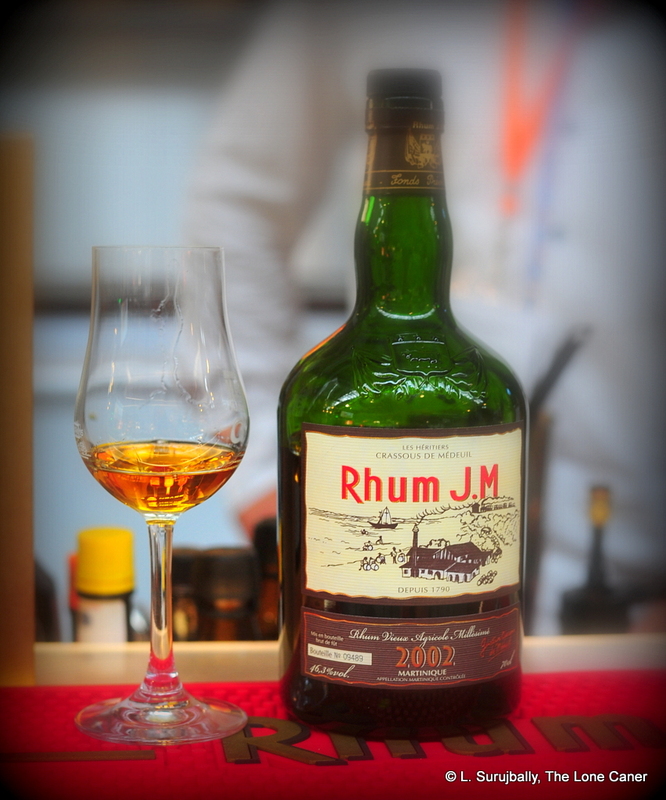 Even at 42% ABV, The Rhum J.M. Cuvée makes a statement for agricoles that is worth listening to. It finds a balance between body, mouthfeel, taste, spiciness and warmth in a way that reminds us that agricoles should not be taken as merely a small subset of the greater rumworld, but should hold a place in the pantheon second to none. While these days my preferences run mostly towards stronger, full proof rums, I must say that there’s nothing about this lovely product that makes me want to ask for it to be dialled up. It’s excellent as it is. Issued as an anniversary edition for the 170th year of production on the plantation in 2015 (which was when I tried it), the Cuvée is a rhum aged at least ten years in oak barrels, gold in colour, and housed in a handsome gold etched flagon of admirable simplicity. J.M. is, of course, the old house on Martinique which issued the haunting 1995 15 year old, as well as the equally memorable 2002 Millesime 10 year old, but I think this one is just a shade better. J.M. as a plantation has been in existence for longer than 170 years – Pere Labat founded the sugar refinery as far back as the 1700s, and it is clear that the current owners have forgotten nothing about what it means to make a top notch rhum. There was a certain tartness in the nose that started things off, something like ginnip and soursop, the crisp and firm ripeness of a green apple. It was not sharp or spicy, just heated and well controlled in a way that made smelling it a joy rather than an exercise in pain management – I didn’t have to set it aside to chill out and breathe, but could dive right in. Once it opened a bit, it softened up, providing additional easy-going scents of vanilla, gingerbread cookies, unsweetened yoghurt and just a dash of pepper and cumin (which is not as odd as it may sound). 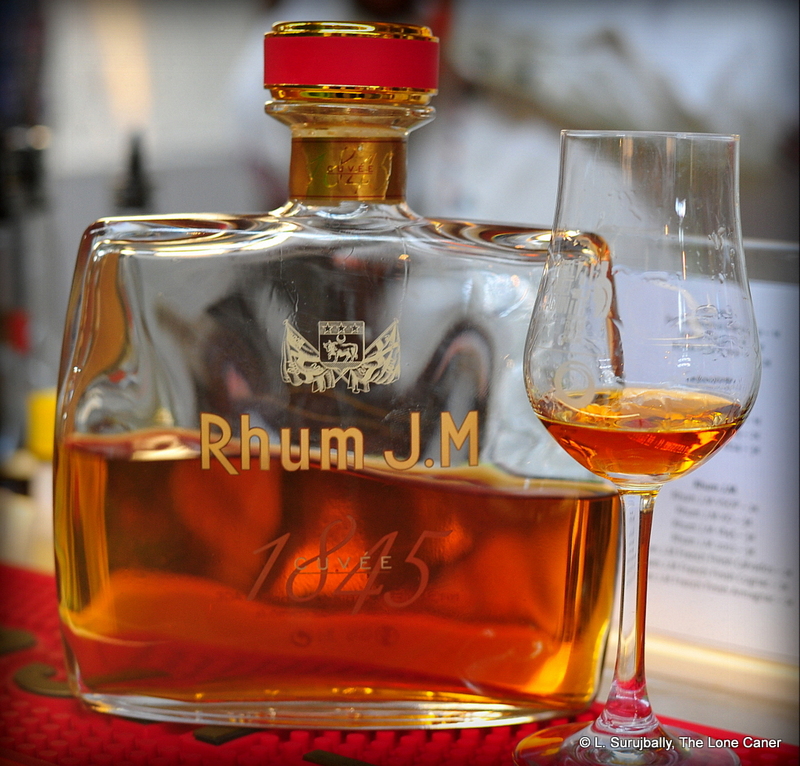 It was the taste that elevated the rhum above its 1995 and 2002 compatriots. What sinks an agricole in the minds of many molasses rum lovers is both the clarity and sharpness, whatever the tastes might be. Nothing of the kind happened here. In fact, it displayed the sort of originality and balance of crispness and softness which many rums these days seem to shy away from in an effort not to piss anyone off. The feel body was medium, soft, and had the instantly recognizable herbaceous background which marked it as a cane juice product. Over a period of time, spices, black pepper, vanilla, light citrus and flowers emerged, surrounded by woody notes from the oak barrels where it has rested. These oaky notes were held in check, providing a background of tannins that did not overwhelm, but enhanced further notes of ginger snaps, orange zest, ripe apples, and created a lovely mix of clear, light softness redolent of these many flavours all at once. And the finish was equally high-grade – sweet, smooth, warm, tasty (nothing new added here, alas); perhaps a bit too short…more a summing up of the whole experience than any effort to go off the reservation by presenting anything new. There’s was something almost sensuous about the whole experience. The 1845, and indeed the rest of the rhums from this company, lacked that peculiar sense of individualism that marked out the Neisson line, yet in their own way are as distinct as any other, and with a quality not to be sneezed at. This is a rhum so well made that sipping it neat is almost mandatory – mixing it might be a punishable offense in some places, and I certainly wouldn’t. Admittedly, the only J.M. rhums I’ve tried have been fairly high end ones – when you can carry only one and buy only one, you tend to chose from the better end of the spectrum – but even among those I’ve sampled, this one stands out. It’s a remarkable, tasty, solid accomplishment from one of the last single-domaine, family-owned houses still in existence on Martinique. And a feather in its cap by any definition. The unquantifiable quality of the J.M. 1995 Très Vieux 15 Year Old has stayed with me ever since I first tried it. Some aspects of the rhum did not entirely succeed, but I could never entirely rid my memory of its overall worth, and so deliberately sought out others from the stable of the company to see if the experience was a unique one. And I am happy to report that the Millesime 2002 10 year old is a sterling product in its own way, and perhaps slightly exceeds the 1995…though with such a small difference in scores, you could just as easily say they are both excellent in their own ways and let it go at that. For all the enthusiasm of the above paragraph, it should be noted that sampled side by side, the two rhums are actually quite distinct products, each good in their own way, but not to be confused with one another. Consider first the aromas hailing from this 46.3% orange gold rhum – they presented as quite fruity and aromatic, quite rounded and mellow, not always a characteristic of agricoles. As it opened up over the minute, flavours of cherries, red grapes, herbals, dill, sugar cane and grass rose gently out of it….and, if you can believe it, a sort of weird and persistent bubble-gum and Fanta melange that took me somewhat unawares, though not unpleasant by any means. On the palate the texture was phenomenal, smooth and warm and assertive all at once. There was little of the aridity of the 1995: it presented a sort of restrained spiciness to the senses; some vanilla and tannins were discernible, but very well controlled and held way back so as not to unduly influence what was a very well balanced drink. 46.3% was a good strength here, and allowed firm traditional vegetal and grassy notes to take their place, before gradually being replaced – but not overwhelmed – by citrus zest (that was the Fanta doing a bait-and-switch, maybe), mint, cucumbers, watermelon, papaya and rich, ripe white pears. And then there was more…rye bread, salt butter, very delicate notes of coffee and chocolate…just yummy. It was an enormously well assembled rhum, luscious to taste and with walked a fine line between Jack Sprat and his wife…one could say it was like the last thing Goldilocks tried, being just right. Some of the dry profile I had previously sensed on the 1995 was evident on the finish, but again, nothing overwhelming – it was warm and aromatic with light tangerines, spearmint gum, more ripe cherries and those delectable grapes I had noted before. All in all, just a great sipping agricole, with similarities to the Karukera 2004, la Favorite Cuvée Privilège and maybe, if I stretched, even Damoiseau’s products. J.M. is located in northern Martinique at the foot of Mount Pele, and I’ve written a company summary in my review of the 1995, if you’re interested. One fact that came to my attention afterwards was that JM char the inside of their barrels by setting fire to some high proof rum distillate, and then scraping the char off, which may have something to do with the fruity character of the aged rhums they put out. 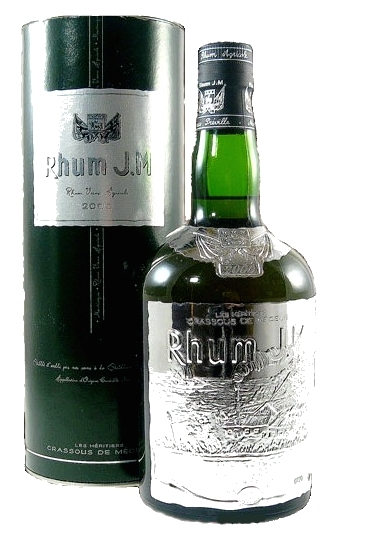 The rhum itself was distilled on a creole copper pot still to 72% before being set to age and then diluted to “drinking strength.” I wonder what would happen if they ever decided to take a chance and leave it cask strength. Most people I speak to about agricoles, especially those who have tried just a few (or none), comment in a way that suggests they are considered pretty much all the same — grassy, herbal, watery, a trifle sweet maybe, and (horrors!) more expensive. A lot of this is true, but after having tried the marvellous variety of rhums from Martinique and Guadeloupe, the sharp industrial chrome of the whites versus softer aged products, I can say with some assurance that there is an equally dazzling variety within cane juice rhums as there is in the molasses based products. And this is one reason why in the last year I’ve really tried to write about as many of them as I could lay hands on. Trying the JM 2002 with its complex, layered and warm profile makes me glad the adventure still has some kinks in the road, and that I began it in the first place. A unique fifteen year old agricole that lacks something of the deep dark depth of the Damoiseau 1980 I so liked, but is a great and tasty example of the style nevertheless…as long as your tastes run that way. As adolescents, among our most fervent wishes was to have coitus without interruptus the way a hobbit has breakfast: whenever possible, preferably all the time, twice daily if we could manage it (well, what teenager hasn’t?) But as the years wound on, some reality entered that little fantasy: the truth is that unlimited anything gets boring after a while. One does not wish to eat manna from heaven every single day, do the same job day in and day out, indulge in neverending bedroom calisthenics…or drink the same kind of rum all the time. I relate this (possibly apocryphal) story to link to another conversation a fellow reviewer and I had not too long ago: that agricoles just weren’t his thing, and remain an acquired taste enveloped in a certain subtle snobbery for those who preferred them. I understand this perspective, since agricoles as a whole are quite different from molasses based rums that reek of caramel, licorice, fruits, toffee and what have you. 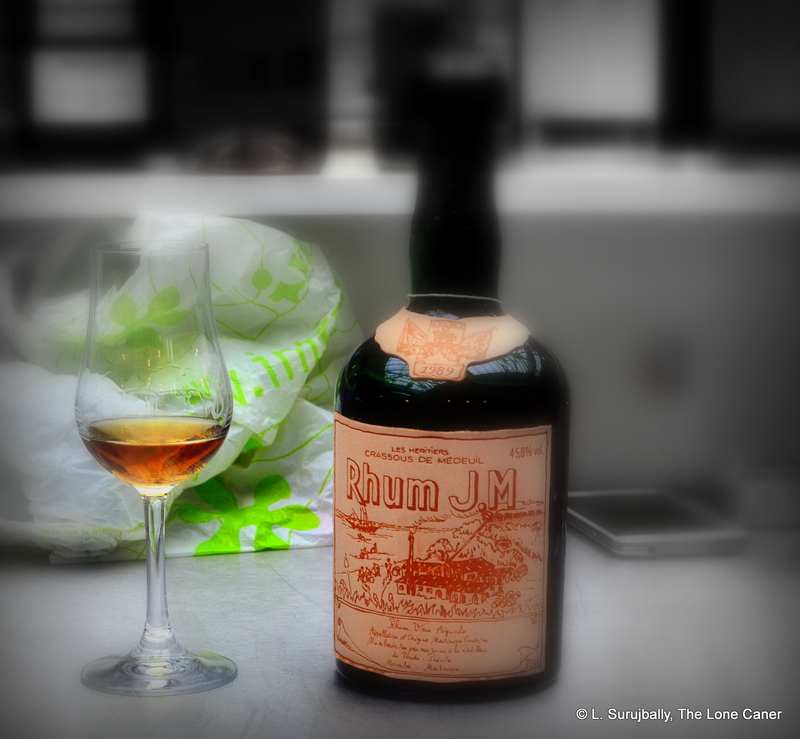 And while I don’t care for the term “acquired taste” – this is where the imputed elitism has its source – the fact is that the gent was right: tastes do evolve: rums which are current favourites may lose their place in the sun, to be replaced by others you would have never dreamed of touching when you were just starting out. Rhums are seen by their adherents to possess remarkable quality in their own right, no matter how much the taste profile bends away at right angles from what others have come to accept as more common (or better). Anyway, remembering the wonderful experience I had with the Damoiseau 1980, when I saw a bottle of the JM 1995 Rhum Tres Vieux 15 year old (which nowadays retails in the €200 range), I dived right in. And believe me, when I say it’s different, those of you who prefer more traditional fare can take that as the absolute truth. It’s not for everyone necessarily, but for those whose palates bend in that direction, it’s quite a drink. As is proper for a top-of-the-line aged product, the green bottle, sealed with wax and possessing a cool leather embossed label came in a fine wooden box that showcased its antecedents, its AOC designation – which means it adhered to stringent manufacturing guidelines such as how soon after reaping the source cane had to be distilled, additions, filtration, etc – and its age. Now strictly speaking, this is a millésime, but it is noted as being a très vieux (very old)…it could just as easily be termed an XO, but I’m not a purist on the matter and will let it pass with just that comment. The single column copper-still rhum was a honey gold colour with coppery hints, and gave promise of a medium-light body, which the nose certainly confirmed. It gave forth immediate scents of freshly mown grass and crushed sugar cane, slightly sweet…and quite dry, though not enough to wrinkle the nose. There were notes of toffee, salty peanut brittle, bon-bons, even a slightly sweetish bubble-gum background which balanced off the brininess. The 44.8% strength was just about right, I think, otherwise we might have really been struck with a dry desert wind on this one. Still, I liked it, and as the taste developed, saw no real reason to change my opinion. The palate was smooth and warm, where all the harmonies of the nose developed to a fuller expression – flowers, rain-wet grass, sugar cane rind stripped with the teeth, a flirt of tangerine rind, and biscuits with dry cheese — a liquid warm croissant with a dab of rich, freshly churned butter — all underlain with a sweetish vanilla background, and almost no oak tannins at all. None of the individual components predominated over any other – the balance was really quite something. What also surprised me was the faint anise taste that revealed itself after a few minutes and melded well into the overall whole. The finish was short to medium and reminded me a lot of the Clemente XO: both had that closing aroma of smouldering cane fields and vanillas that to this day evoke so many memories. Situated in the north of Martinique in Bellevue, J.M. began life with Pére Labat, who was credited with commercializing and proliferating the sugar industry in the French West Indies during the 18th century. He operated a sugar refinery at his property on the Roche Rover, and sold the estate to Antoine Leroux-Préville in 1790 – it was then renamed Habitation Fonds-Préville. In 1845, his daughters sold the property again, this time to a merchant from Saint-Pierre names Jean-Marie Martin. With the decline in sugar production but with the concomitant rise in sales of distilled spirits, Jean-Marie recognized an opportunity, and built a small distillery on the estate, and switched the focus away from sugar and towards rum, which he aged in oak barrels branded with his initials “JM”. In 1914 Gustave Crassous de Médeuil bought the plantation from his brother Ernest (I was unable to establish whether Ernest was a descendant or relative of Jean-Marie), and merged it with his already existing estate of Maison Bellevue. 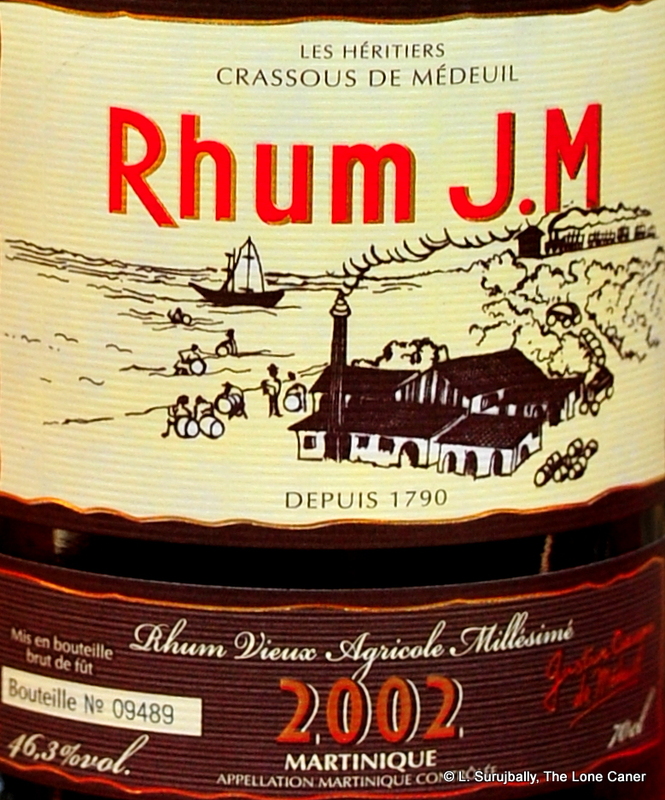 The resulting company has been family owned, and making rhum, ever since and is among the last of the independent single domaine plantations on Martinique. If I had fault to find at all in the rhum, it was its aridity, which subtly spoiled (for me) the smoothness of the overall experience, and is another reason I appreciated its relatively lower proof. Though my sample set of agricoles is too small to make the claim with assurance, it may also speak to my palate being adulterated by rums that have added inclusions (like sugar) to smoothen out such a profile, a practice eschewed by AOC agricoles. Still, summing up, this is a rhum I’ll have to come back to, in the years to come, and will probably rise in my estimation much as the Clemente did. The J.M. 1995 is the kind of rum I’ve been pestered about for ages. People couldn’t quite describe it, but they said I had to sample it, and review it. I just had to. Many French West Indian distilleries adhere to a certain puritan strain of rhum production (whether or not they apply for AOC rating). They use cane juice, don’t add anything to their rhums to either colour them or adulterate them, often issue them at cask strength, and sniffily refer to molasses based rums with the somewhat disdainful moniker of “industrials”. They may have a point – if there had ever been a pure ethos of rum making, shorn of all the modern and technical innovations, surely it is the agricoles which represent its continuance in modern times. They are a miniscule part of the rum world by volume of sales, yet they hang in there, producing these uniquely tasting, offbeat rums, seen by their tasting champions as exemplars of the craft the way it is, and was, meant to be. I don’t really agree with that concept 100%, since it is in the nature of mankind to move forward and evolve…and to stick with “the way things were” forever strikes me as unreasoning, almost fanatical, adherence to a single tradition or ideology. But there’s no doubt that JM, with rhums like this one, are probably on to something, and to tamper with the philosophy of how it’s made would be to discard a link with rum’s past, lose the variety that makes rum great, and leave us poorer for it. So while not all aspects of the JM 1995 find favour with me (all apologies to the cognoscenti who feel the opposite is true), I acknowledge its distinctiveness and remarkable profile — and if I don’t entirely fall under its beguiling spell, I don’t hate it either, and maybe it’s all just a case of me still acquiring the taste.